The year is young and yet already the literary world has been confronted with several novels that force readers to experience a parent’s bleakest nightmare, the abduction of a child – in both cases, that of a girl. The stakes are high with a subject like this. The American detective novelist Laura Lippmann has described such missing-person novels as real-life ghost stories where those left behind are haunted by the possibilities of what has happened to their loved one. There is another side to the story: that of the point of view of the missing person. This is the premise for Claire Fuller’s debut novel, and it’s a triumph. Our Endless Numbered Days is inspired by fairytales; the story’s menace is more Hansel and Gretel than that of a parent’s real-life horror story. Peggy, a young girl, is stolen away by her survivalist father to “die Hütte”, a ramshackle cottage in a European forest, and tells her that the end of the world has come, that her mother has died and they are the only survivors. This much we know at the start: it is 1976 and Peggy’s father is building a fall-out shelter for the seemingly inevitable armageddon. He teaches eight-year-old Peggy to catch and kill a squirrel and trains her to pack a rucksack with everything she needs within four minutes of the blow of his silver whistle. When Ute, her mother, goes travelling with work, her father takes Peggy on “a holiday” to their cabin and cuts them off from the world. He tells Peggy that Ute has died and that a storm has wiped out the rest of the world. So begins their strange existence in the woods. We know that Peggy survives the ordeal because twinned with this narrative is another set in 1985 – nine years after she went missing – when she has been reunited with the very much alive Ute, who has since had another child, Oskar. Peggy, we know, has arrived at her mother’s home malnourished with rotten teeth and only half an ear. “What did you like to eat when you were away?” Ute asks, “were away” being her euphemism for Peggy’s disappearance. Peggy’s feelings about her father are confused: she cuts out a small photograph of him and sticks it under her right breast. “I knew if he stayed there, everything would be all right and I would be allowed to remember.” Within 50 pages, you are swamped with questions: what really happened that summer? How involved was Ute and where is Peggy’s father now? Slowly, the memories come back. Fuller handles the tension masterfully in this grown-up thriller of a fairytale, full of clues, questions and intrigue. Woo-hoo! What a fantastic review, Claire (and rightfully so). This is so, so exciting. My copy should arrive very soon now. What a great review! Definitely onecthat makes me want to read your book. Thanks Liz. Let me know if you do. I couldn’t be more pleased. Thank you! On Amazon USA? Link please! Sounds wonderful. Hi Kate. 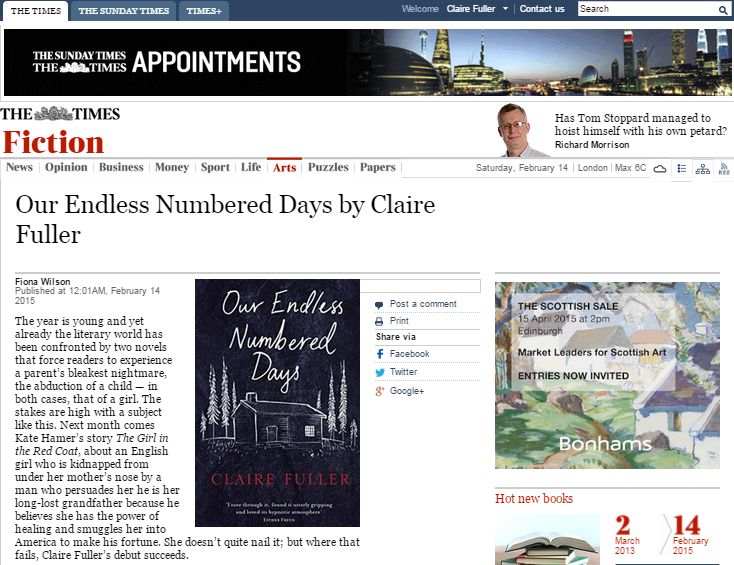 Here’s the link: http://www.amazon.com/Our-Endless-Numbered-Days-Novel/dp/1941040012 It’s out on 17th March in the USA, but you can pre-order it now. How wonderful and, I’m sure, well deserved. I’m looking forward to reading it. I will have to order the book..